Welcome to Eaglehawk Dive Centre. 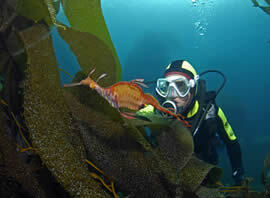 Our PADI 5 Star Dive Centre is situated on the Tasman Peninsula in southeastern Tasmania at only 1 hour from Hobart. Eaglehawk neck is the gateway to the spectacular Three Capes Track or the historical site of Port Arthur Convict settlement. We can offer you a great diversity of world-class scuba diving sites in this area, including the famous Cathedral Cave, the historic wreck SS “Nord”, or the magical sponge garden at Sisters’ rocks. Come and dive with very playful Fur Seals or meet the bizarre Weedy Seadragon. We have sites suitable for divers of all levels of experience from novice to technical. Our staff, several of whom are marine biologists, have extensive local knowledge from thousands of hours spent diving around the Tasmanian coast, and include professional underwater photographers and videographers. Here, at Eaglehawk Dive Centre you will recieve a personalised quality service in a safe and relaxed environment. Our boat trip includes 2 dives at 2 different sites. Enjoy the ride along the Forestier and the Tasman Peninsula coasts, some of the most iconic scenery in Australia. During the surface interval our friendly staff will look after you with hot drinks and snacks. Consider a one day experience that requires no previous diving experience. Come and take your first breath underwater, introduce yourself to the underwater world, discover the local sealife. Visit Tasmania in a different manner. Do your Open Water Diver level with all the theory online – at times and place to suit your busy lifestyle. Then spend just 2 days at the dive centre for the in-water practical. With small classes you will receive personalised attention from our experienced instructor. If you want to continue your diving education we offer regular Advanced Open Water, Rescue Diver and various specialty courses.